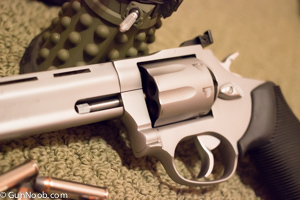 You may remember that I reviewed the Smith & Wesson 686. In that review, I discovered that I don’t, in fact, hate revolvers. Anyway, tragedy of tragedies: I had to give the 686 back to my friend. Pro tip: buy the gun from a person BEFORE you publish a glowing review of it. So there I was revolverless and in need of a revolver. Now, I’ll admit that there are a disproportionate number of Taurus gun reviews on this site but I assure you they’re not a sponsor. With this being a beginner focused site, Taurus and their low prices tend to be most people’s first gun. It also means that, since I have a wife that I’m putting through college, it’s easier for me to afford a Taurus in cases like this where I’m reviewing a gun I actually own as opposed to a borrowed, rented or T&E gun. So yeah, I got a Taurus 627. Truth be told, now that I’ve shot this gun, I’m glad I got this over the Smith & Wesson. 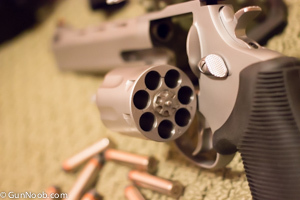 A little warning: there’s going to be a lot of comparisons between this gun and the S&W. Feature wise, the Taurus has a lot more going for it. I like the grip of the Taurus better, for starters. My fingers never truly fit right on the S&W’s grip and, had I bought it from the friend, the first thing I would have done would be to put a different grip on it. Secondly, I like the longer barrel of the Taurus. The longer sight radius really makes for great accuracy. It also holds seven rounds as opposed to the S&W’s six. Like the S&W, the Taurus 627 also has adjustable rear sights which did require a bit of adjusting right out of the box. Finally, we come to the porting on the barrel. In a normal barrel, the gasses that propel the bullet will escape from the end of the barrel once the bullet leaves. That sudden pop of pressure contributes greatly to the muzzle flip of the gun and increases that dreaded “felt recoil”. 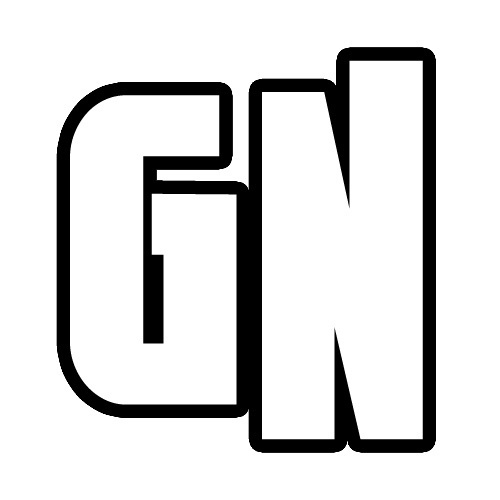 By drilling a bunch of upward pointing holes on the end of the gun, most of the gasses escape in that upward direction before the bullet leaves the barrel. This pretty much removes the muzzle flip caused by those gasses and actually works to counteract the recoil caused by the natural physics of the gun firing in the first place. This was the first gun I’ve ever fired that had a ported barrel and let me tell you: it has spoiled me. While the weight of this gun had a bit to do with it, the combination of that and the ported barrel meant that .38 special rounds had, at least to me, less recoil than the .380 SIG P238 that Mrs. Noob was shooting in the next lane over. The recoil was so light that, after the first shot, I actually unloaded the remaining 6 rounds to check for a squib because I could have sworn it was a bad cartridge. Nope, the recoil was just that light. Like a little kid, I excitedly called the wife over saying “SWEETY! YOU GOTTA TRY THIS YOU GOTTA TRY THIS YOU GOTTA TRY THIS!!! !” all the while bouncing up and down like a hyperactive terrier. With an air of skepticism (and slight annoyance by my excited nature), she gave it a try. After firing the first round, the look of shock on her face was priceless! She immediately looked at the gun and said a phrase I can’t repeat here due to the PG-13 nature of the site but it rhymed with “Foley Spit”. After that, I had trouble getting the gun back from her so that I could finish the testing. As light as the recoil was with .38 special, I was expecting the .357 magnum to be light as well. To the gun’s credit, it didn’t have much in the way of muzzle flip. Wooo boy the recoil was still there, though. The weird thing was, I felt almost all of it in my shoulders. I can honestly say I’ve never shot a gun that felt like this before. I really want to try a ported semi-auto pistol to see if it has similar characteristics! 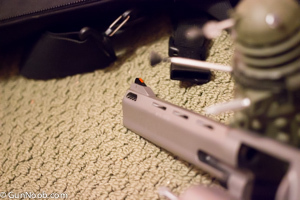 In the review, I spent a bit of time waxing poetic about the trigger on the S&W as well. I’m happy to report that the trigger on the Taurus is also a great trigger. 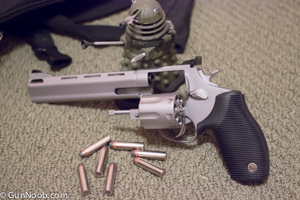 In single action, the trigger feels a bit heavier than the the S&W’s trigger did. This is a good thing as it’s harder to accidentally fire the Taurus 627 when it’s in single action mode. 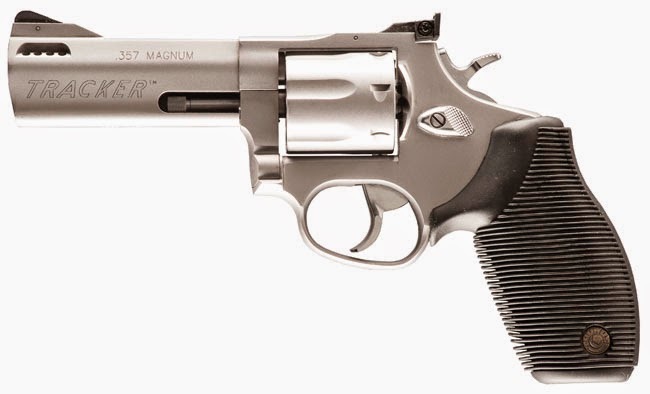 There isn’t any grittiness or sponginess in the 627’s trigger pull. My only complaint is that there seems to be a false reset point a little bit before the actual reset. In times of rapid fire, this could throw off a shooter so be aware of it. I can’t think of a clever segue to go here so let’s just get to the tests. Under normal circumstances, this is an automatic 5 out of 5 but, those holes in the barrel become a bit of a double edged sword. They do truly help recoil but they are a pain to clean. They do need to be cleaned also because the carbon from all that cheap ammo collects in there pretty bad. As much as I love those things, it does add some extra difficulty in cleaning. Combine that with the fact that there aren’t many tools readily available to dig into those things (I had to use a dental scraper), the 627 gets a 4.5 out of 5 for maintenance. Revolver and reliable both start with R.
No external safety. It has a heavier trigger pull which makes it harder to accidentally shoot. It has an integrated lock that renders the gun unusable (just like all Taurus guns). It also has what is called a “transfer bar” meaning that the hammer doesn’t actually strike the firing pin directly. There’s a bar that is raised up between the hammer and pin only when the trigger is pulled which also helps against accidental shooting. You get a cardboard box, a couple of spare keys, a manual and a warranty card. This is always Taurus’s weak point. In order to keep the costs down, sacrifices have to be made somewhere. It’s either drop the quality of the gun or cut the toys in the box. Still, the category is what it is. 1 out of 5. A plastic case would have bumped it up to at least a 2. Like any revolver, there isn’t much room for upgrading. The nice thing is, there’s lots of options available for those things that can be upgraded. There’s no shortage of grip options and I’ve found some interesting trigger upgrades. Taurus also sells a scope mount that can be clamped on to the gun which has the potential to add some interesting toys. All in all, I’m not disappointed at the selection available. If you’re looking for a revolver to kick off your collection, you really can’t go wrong here. It’s super accurate to shoot. The recoil won’t scare off noobs and makes it easy to shoot this all day long. The price is right. It even looks cool, which is a bonus. The Taurus 627 gets a solid 4 out of 5. Although I will say this: I’m probably not going to do too many more revolver reviews. They’re fun guns and all but, with the exception of one or two nuances on occasion (i.e. trigger and such), they’re just not unique enough in their function to make for an interesting review. Now, that is actually a plus in the revolver column, if you think about it. If every revolver behaves almost exactly the same, it makes it far easier to just pick up a revolver and go. Great for shooters, bad for reviewers. There’s only so many times I can type “It’s a revolver. You don’t have to worry about _____”. Heh, heh. You’re hooked now. Welcome to the round side of the force. Very nice review! Just bought one at our local pawn, used VGC for $275!!! Soon as the freakin rain stops pouring I’m out to the range!! I have owned the 6.5″ titanium model chambered for 357 for around 14 years. I intend to always keep it. I have carried it a lot more than I have fired it. I find the recoil to be direct and satisfying. I just ordered a Hogue grip for it. I never cared for the “ribber” or whatever they call that spongy grip. 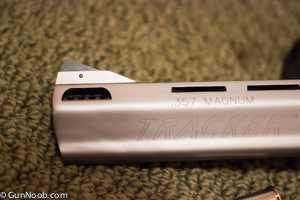 I love my tracker, its the most accurate handgun you will ever shoot. My only concern is long term longevity by putting thousands of rounds through the compact frame. The porting helps with recoil and stress on the gun, but my concern is still there with that aspect. However, doesn’t mean I won’t keep it for home defense, small game hunting or just some fun target practice. Accuracy is best I’ve seen.